I've decided to explore more of the children venues available downtown. 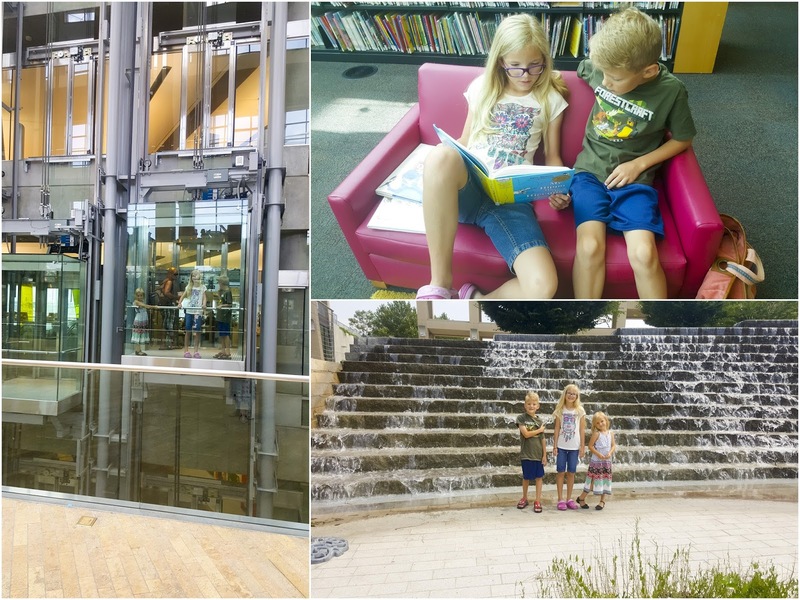 Last week we drpastpass the Salt Lake City Library on our way to Gilgal Park. 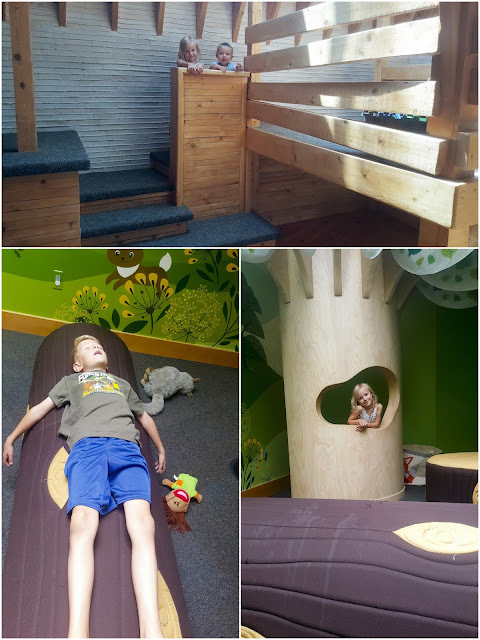 A neighbor raved about the children section so today we made a trip to visit it. The library is located on 400 South, so I chose to take the HOV exit from I-15. We drove past Pioneer Park on our way to the library and I was dismayed by the number of homeless people roaming, lounging or sleeping on the streets. It his truly heartbreaking to witness, and very dangerous. The library is a public facility and there were several homeless people right outside the building and a few inside. You have to have a key code to enter the bathroom area in the children section. I am sure it is a precaution because of the homeless. The kids were amazed to enter a library that took up five floors. We've always only been to our county library, which is much smaller. The children's section is in the basement so we took the glass elevator down. Once there we had to explore the play area. There are two rooms. One is decorated to look like a forest. The second is made up of wood beam placed at different angles and platforms for kids to climb on and jump off. I thought the SLC library was part of the county system but they are two separate entities, so the kids were unable to check out books. The kids found a book of poetry titled "My Hippo Has the Hiccups" by Kenn Nesbit that they had to have so I ordered it online. The museum has fun activities scheduled weekly. They were teaching a class on how to make game place holders with a 3D printer the afternoon we were there. Unfortunately, the class did not get out in time for me to make a meeting with our adoption attorney so they had to pass on it. But I plan on seeing what types of things we can do with them in the future. On our way out, I allowed the kids to ride the glass elevator to the top 5th floor and back. They thought it was the best thing ever. Outside the library are a garden and waterfall fountain. We had to check that out before heading home. The Leonardo Museum faces the same plaza. That has been added to my bucket list.